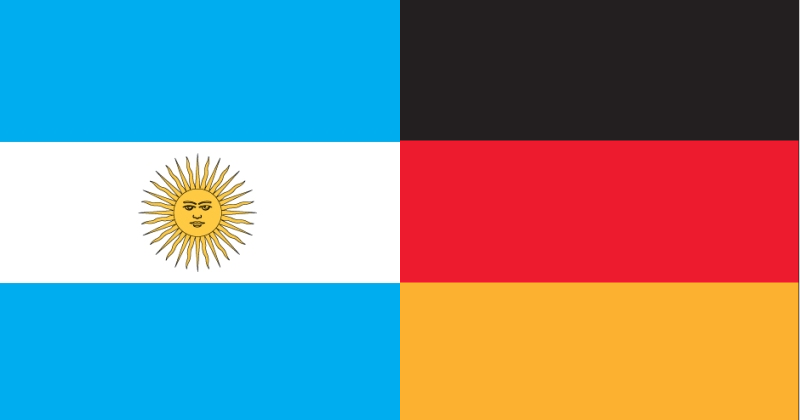 Germany and Argentina lock horns in the final of a certain major footballing tournament this weekend, and your guess is as good as ours as to who will come out on top (it’ll be Germany – but feel free to mock us if we’re wrong!). But forget about football: who would win in a musical battle between the 2 countries? For this week’s Friday playlist, we’ve compiled the best of Germany and Argentina’s most popular bands and given each song a score out of 10. The country with the most points at the end wins! Enjoy the unique sound of Argentina’s biggest band, Soda Stereo. Well, it’s not that unique. But they do sing in Spanish, which is nice. Overall, a solid effort. Rammstein are actually one of the world’s most popular bands, despite singing only in their native German. Sonne was their breakthrough song and is a bit of a classic with crunching guitars, booming vocals and a really, really weird video. Now this is more like it! Los Fabulosos Cadillacs are renowned for their sunny brand of ska and Matador is a perfect slice of summertime satisfaction. They get bonus points for including topical football whistles. Despite being German, Tokio Hotel look more like a band from a Japanese anime. The music itself is pretty generic stuff, taking its cue from the likes of My Chemical Romance and 30 Seconds to Mars. Not a great performance, unfortunately. We could barely hear this when we first put it on, but managed to crank the volume up enough to hear a slick slab of Latin funk. We like it, but they lose points for nearly deafening us when we put on the next track with the volume still up. Hang on; haven’t we already had this one? Augen Auf sounds very, very similar to Sonne, complete with a count to 10 in German. Still, it’s a pretty good song and they earn points for having the best band name in the competition (narrowly beating out Los Fabulosos Cadillacs), but the song loses points for lack of originality. Why is Love So Hard? is the question posed by this moody slice of gothic rock. We can’t answer that, but we can imagine brooding over a nice glass of Rioja while chilling to soothing lead guitar of this track. We like it. A lot. We wouldn’t have minded some vocals, though. This is a cut of classic thrash metal, with Kreator sounding quite a lot like a German Slayer (which, incidentally, is what Lionel Messi might be called after Sunday night). It lacks the emotion of Rata Blanca but rocks at least 3 times as hard. ARGENTINA WINS by a solitary point! Germany performed well, but were let down by the poor performance of young Tokio Hotel. Argentina, meanwhile, performed consistently throughout and that was enough to bring them home the trophy, despite a ‘band of the match’ performance from Rammstein. Enjoy the football on Sunday and remember, if you’ve suddenly developed a love for Argentine or German music (and why wouldn’t you? ), you can sell all your English CDs with musicMagpie.